We can almost see spring on the horizon and we are so excited for the flowers to blossom and the sun to return that we are celebrating with this super healthy dish. This lemony grilled chicken breast teamed with saffron spiced freekeh and a zingy zahtar dressing is the perfect dish to give you that (almost) springtime feeling! Preheat your grill to medium-high. 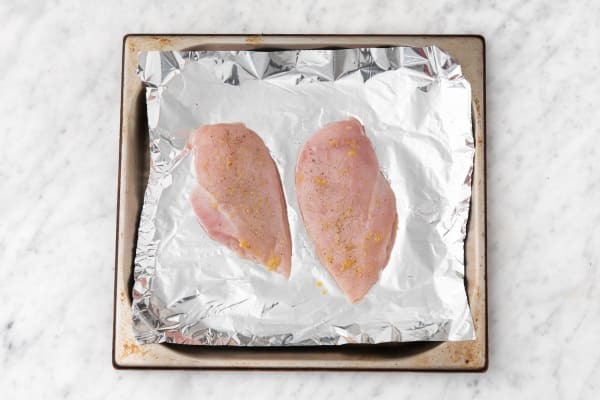 Pop the chicken on a foil lined baking tray and season with salt and black pepper. Zest the lemon using the fine side of your grater. Massage a splash of oil, a pinch of lemon zest and salt and a grind of black pepper into your chicken and keep to one side. Wash your hands and get on with the rest of your prep. Cut the shallot in half through the root, peel and then slice into thin half moon shapes. 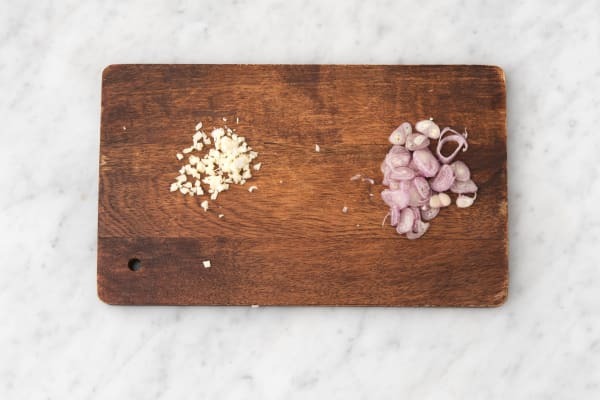 Peel and grate the garlic (or use a garlic press if you have one). Remove the core from the red pepper and cut into slices 1cm thick. Pop a saucepan on medium heat and add a splash of oil. Add your shallot and cook for 5 mins. Once soft add your pepper and cook for 5 mins more. Then add your garlic and saffron and cook for 1 minute more. Add the water (amount specified in the ingredient list), bring to the boil and then add the freekeh. Season with a generous pinch of salt and reduce the heat to medium-low. Cook your freekeh for 15 mins. With the freekeh cooking away, pop your chicken under your grill and cook for 20 mins. Turn after 10 mins to make sure both sides colour evenly. Tip:The chicken is cooked when it is no longer pink in the middle. Meanwhile, roughly chop the parsley and mint. Cut the chilli in half lengthways, scrape out the seeds and then thinly slice the chilli widthways. 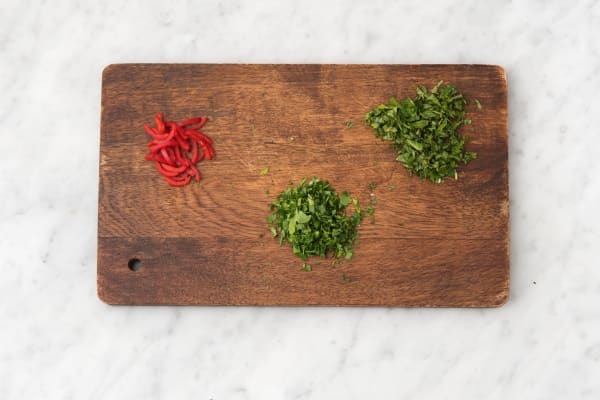 Pop the zahtar spice into a small bowl and add a squeeze of lemon juice, a quarter of your parsley, all your mint and a splash of oil per person. Mix well and add a pinch of salt and as much chilli as you dare. This is you zahtar dressing. 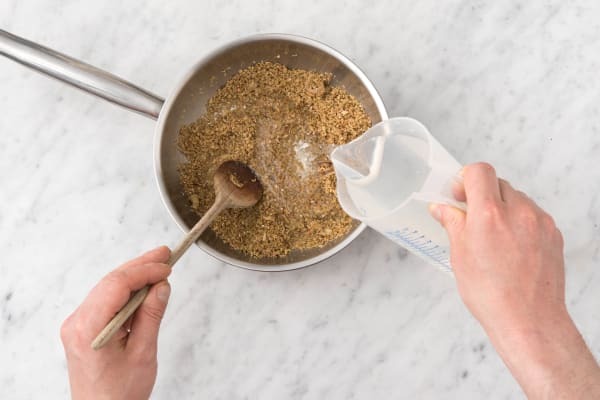 When your freekeh is cooked, drain off any excess liquid through a sieve. Return your freekeh to the pan off the heat mix in your remaining parsley and a good splash of lemon juice. Taste and add more salt and black pepper if necessary. 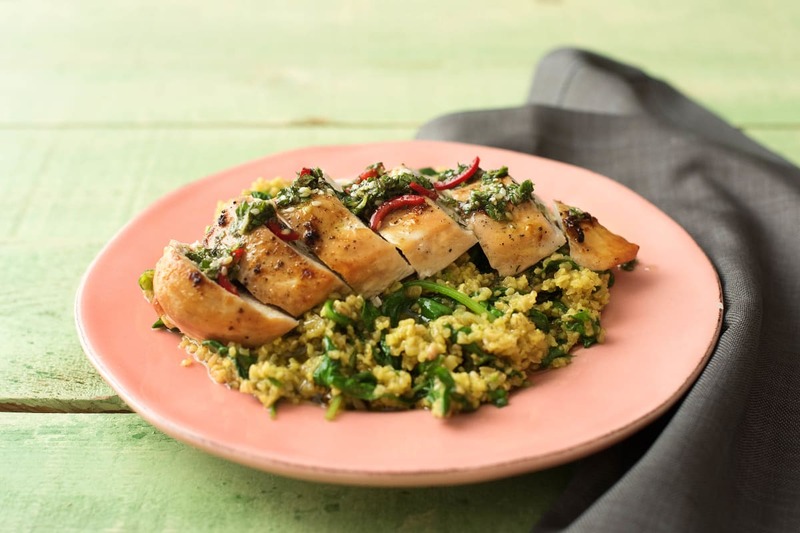 Slice each chicken breast into six slices and serve on top of a generous portion of freekeh. Finish the dish with a drizzle of your zahtar dressing. Enjoy!